Born October 9, 1948, in Calgary, Canada. Studies of art and design at various universities. 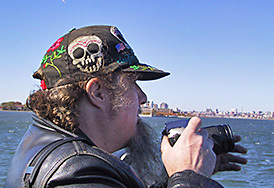 Since moving to New York City in 1979, his work has focused almost exclusively on documenting the art, life and times of the Lower East Side in Manhattan. Fights against the injustice of state-authorities. In 1994 he organized the first NO!art show in his gallery after 20 NO!years. Took part in the NO!art-box multiple at Edition Hundertmark 1996, and in the NO!art-show at Janos Gat Gallery in New York in 1998. Works as Documentary-, Libertarian-, and Tattoo-artist in New York together with his wife Elsa Rensaa and various social groups. Owns and runs the most voluminous and important NO!art video-archive. Lives in New York and leads the NO!art headquarters west.